Every so often, we hear about a strange radio signal winging its way Earthward from the cold, lifeless depths of outer space. Suddenly, bored news personnel around the world come alive and begin churning out sensational stories with lurid headlines promising that this is really it—our first contact with alien minds. In fact, radio astronomers have a long history of detecting mysterious signals that just don’t seem to fit into their carefully ordered vision of the universe. For instance, pulsars were initially thought to be intelligent signals from beyond the solar system. When discovered by astronomers in Cambridge, England, the first pulsar signals were dubbed “LGM”—that’s “little green men,” in case you didn’t know. 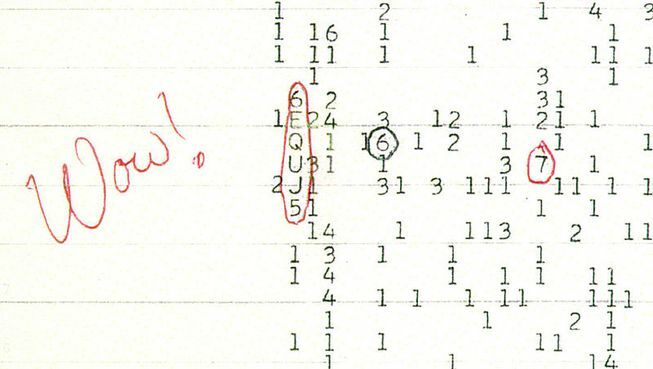 And who could forget the famous “Wow!” signal of 1977, detected by astronomer Jerry Ehrman at Ohio State University’s “Big Ear” radio telescope. It was a 72-second anomalous transmission in the 1,420 MHz range—the natural frequency of neutral hydrogen emissions, which physicists Philip Morrison and Giuseppe Cocconi speculated might be the medium of ET communications, given its cosmic ubiquity. The “Wow!” signal is still unexplained, and its like has never been seen again. These instances were hardly the first—Nikola Tesla and Guglielmo Marconi, those indefatigable pioneers of technology and radio, claimed to have heard interplanetary transmissions in the early years of the 20th Century. Alas, we are still awaiting that momentous day when the announcement of such a communication will be verified as true. The alien “signal” in question needn’t be restricted to radio or other electromagnetic transmissions encoding deliberate messages; it could be something as innocuous as the absence of a signal—repeated or arranged so as to arouse a suspicion of intelligent origin. For instance, there’s the controversy surrounding the mysterious “Tabby’s Star” (KIC 8462852), which has been amply reported in Futurism. Scuttlebutt has it that Tabby’s Star might be surrounded by some sort of alien megastructure that’s causing the astonishing dips in the star’s bolometric luminosity—at least, that’s what some astronomers have suggested, with tongues at least partially planted in cheek. But let’s not deceive ourselves. Invoking extraterrestrial intelligence to explain a mystery that, for the moment, confounds us to no end and monkeys up our cherished understanding of things is a bit of a deus ex machina—like the god swinging down from on high in the old Greek plays, happily arrived at just the right time to resolve all the unspliced threads of the plot. The truth is, a mysterious signal is just that—and nothing more. To say it must be of extraterrestrial origin is to say precisely nothing at all; sure, it could be an alien signal, because intelligence could be responsible for virtually anything. In a universe that doubtless has many more surprises in store for us, it’s safer to search for alternative explanations. As for Tabby’s Star? It’s probably just surrounded by a swarm of comets, asteroids, and planetary debris—that, or some equally prosaic and entirely dull explanation.